The absurd comedy style of Frank Sidebottom appeared as real as could be. Besides his papier-mâché head, bright blue eyes and tar like hair, there always stood a man with a high pitched nasal Mancunian accent throwing all his energies into his performances. Whether it was covering pop classics to fit with his on stage person, such as turning Queen’s ‘We Are The Champions’ to ‘I Am The Champion’ or wandering around his local town of Timperley, Frank was a larger than life character. Nevertheless, a question always remained as to his true identity. Who was beneath this gigantic head? Steve Sullivan’s documentary Being Frank: The Chris Sievey Story directly addresses this very question. Portraying the creative process in a delicate manner, the film looks upon its titular figure with a sincere fondness. The man behind the sweaty head was in fact Chris Sievey, who sadly passed away in 2010. Working for years under the persona of Frank, he also constantly produced works of stop animation, graphic design and his own music. Finding some time in central London to sit down with a coffee and discuss the film and his relationship with Chris/ Frank, Steve was heartfelt and open when talking to The Quietus. 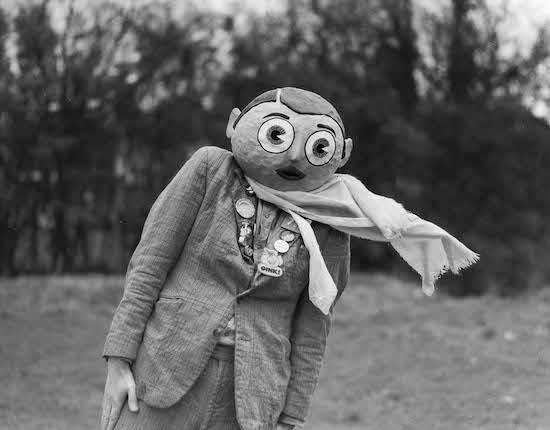 What was your first interaction with Frank Sidebottom? Well, it was it was actually when I worked in a comic shop in Preston called Thunderbirds Comics. We had two branches, one in Preston and the other in Blackpool, and we had booked Frank to do a personal appearance. So the phone went on one Saturday when I was working there and it was Frank Sidebottom! Oh my God it's the guy with the big head, I thought! So I went and got my boss and told him Frank was phoning to ask him about all the things you need to know about his personal appearance. ‘’What time do you want me?’’ ‘’Where do I park?’’ and ‘’How much do I get paid’’ were his questions. So my boss came and got to chat with him and I was fascinated because he's talking to Frank Sidebottom. About a minute later my boss just looked over to me in a really curious way – he had just put down the phone. I rushed over to my my boss and he just looked totally confused. I said, you didn't say goodbye! He said ‘’Well I would have done but we got about a minute into the conversation and he shouted ‘’Oh, I've got to call me mum’’ and slammed the phone down on it. So I was a 14 year-old just totally fascinated with this character. Why would you do that? Why would sabotage your own business just for a joke? So he was a figure I stopped thinking about until his comeback in 2005 by 2006. And this comeback led to you working with him…. Yep, I had become a filmmaker by that point. A friend of mine was a big fan so I asked how do I get in touch? There's only one way to contact Frank: a PO Box in Timperley. You needed to write to him personally. On a Tuesday I wrote him a letter and by the Thursday he got straight back to me. Stating on the Sunday I should bring a fantastic film crew, I turned up and he was doing his ‘Magical Timperley Tour’. The tour was just him with his 100 biggest fans, all on an open top bus tour of the village, on the outskirts of Manchester. The joke was it's just a village and you know it is nothing apart from a normal village. But to Frank, Timperley was like the showbiz centre of the universe, largely because Paul McCartney once flew over in a plane. It was just absurd, which I thought was magical. The film was crowdfunded, similar to Chris’s funeral. How did the project initially come to you? Making a documentary on Chris/ Frank was on my mind for a few years after Chris’ death but I really wanted to leave it a respectable length of time. After a while I just I just thought I still want to know who was Chris. So, I emailed his friends inquiring about making a documentary on who was Chris. His brother Martin e-mailed me straight back to suggest I help clear his house. He had hundreds of boxes filled with personal possessions. This was an absolute godsend but a total curse at the same time. I ended up living with Chris’s personal possessions for the next six years just trying to just pull them out from the boxes and make sense of its glorious creativity. Suddenly, I found out there was this whole other world to Chris that wasn't about Frank Sidebottom. But in the end Frank took him over; Chris ceased to exist. I noticed you shot all talking heads from a very low angle shot, which means you see their whole body language, particularly with his wife. Was this a conscious decision? It wasn't just body language I had in mind. Shooting in big wide shots was a way to create this environment through every interviewee that ties them to Chris and Frank. We'd fill the frame with things from his archive. When you watch it in cinema you've got these nice relaxed wide shots and people talking, to then cut to Frank in close up – he's just towering over you in these massive close ups. That's what it was like to be around Frank Sidebottom. That's what it was like to see him on the telly. He was larger than life. Those shots were a way within the cinema to give you that impression. There is a lot of original artwork in the film. From the start of the process did it evolve with you having access to his archive or an element previously discussed with your creative team? It was about me going through the archive. It was only when things in the archive started to make sense that then you can start to think what to do as a filmmaker. Also, film is created in the edit, you know. It's juxtaposing things and trying things in a different order to see where that goes or where that has the most impact. When you start looking through the archive and finding these notebooks, finding out that that a particular passage in a notebook really tells us where he [Chris] was at in his life. It points or it tells us what his philosophy is or informs us what he's trying to do and how then do I present. So, when approaching the film’s artwork, we thought to just animate them. Let's see his drawings presented in a different way. I didn't know when we started but it was just start to explore cinematic ways of presenting them. I was studying in Manchester when Harry Sievey [Chris’ youngest son] was killed a car crash [in July 2018]. Was there any thought when approaching the edit to shift perspective given this tragedy? Harry was the last person I interviewed. He died about a month after we interviewed him which was a total shock. It didn't censor anything about Chris or Harry because they were both such honest artists. I don't think he would have wanted it censored. I said that to his children from the start that what I want to make you is something that's really honest about it. I think Harry would have said the same you know. Everything he told me about his dad was what he wanted to say. I wasn't expecting him to die, obviously. Then at the end of the film you've got this little section where you find out how he's died and it does change the film…. You talk about honesty and being literally frank about Frank. How did you negotiate getting all the sensitive information from the family on film? They were open with me right from the start. The fact that I'd worked with Chris previously on the Timperley tour went a long way because I’d shown to be a good colleague of his while he was alive. You know it was easier to convince some that I was genuine. But once I did that we'd had the first meeting and they were just so on board with the idea. A level of trust arose through these initial responses. I got the impression it was quite cathartic for them to talk about Chris so openly, particularly for the kids. Their dad was a larger than life character…. Yeah he could totally drive you mad domestically. Sterling, his oldest son once told me a story once that his mum was trying to do the ironing one night. She was wondering where the ironing board had gone. It turns out that Chris had taken it all – or Frank did – onto a stage to be a puppet. You know, he was totally unpredictable, which is hard when you're trying to live a conventional life of raising children, sending them to school, and all the rest. At home you've got this guy who's just this wonderful creative mind but you can't control him and you can't get him to focus on anything sensible.